'Insecurity Cameras' To Track All Of Town's Traffic The town council in Tiburon, Calif., voted to spend $200,000 to install security cameras to screen every car that comes into the affluent, low-crime town. But some say the recordings could open the town up to lawsuits or be used against the residents themselves. The town of Tiburon, Calif., voted last week to spend $200,000 to place six security cameras at strategic points to ensure none of the cars coming into town are stolen. A little town in California has a big and controversial idea: It wants to install security cameras on roads leading into town so that it can screen and record every license plate that comes inside city limits. 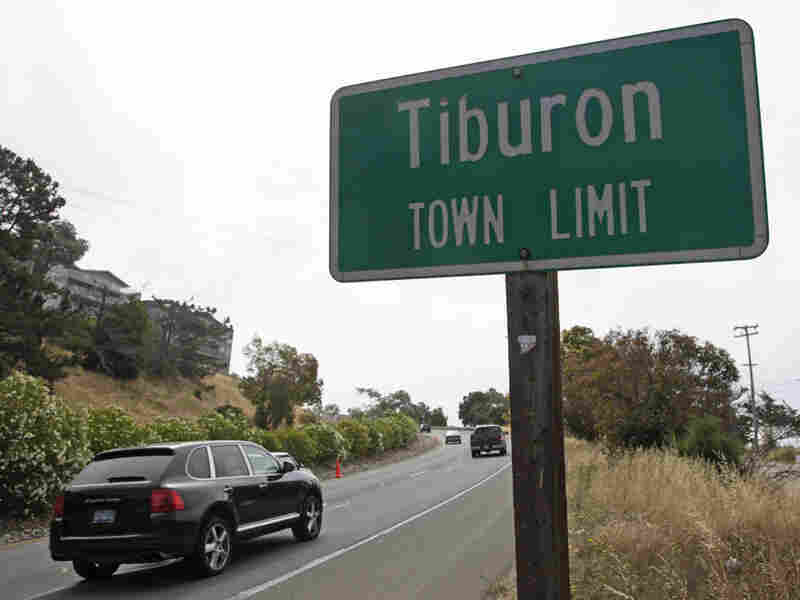 The plan could effectively turn Tiburon into perhaps the nation's first public gated community. Most people in the Bay Area couldn't tell you which winding road leads to the tucked-away enclave, across the Golden Gate Bridge from San Francisco. It's a place that values its privacy and its security. "Tiburon is unusual because there are only two roads going in and out of the town," says Mayor Alice Fredericks. It's quite easy, she says, to keep track of every car along those two roads. Last week, the Town Council decided to spend $200,000 to place six security cameras at strategic points along the road. For now, the plan is to make sure none of the cars coming into town are stolen. Crime statistics are low in Tiburon, but in a small town, Fredericks says, even a few crimes make an impact. "If you're out and about the way I am, every day you run into someone who was affected by a crime or knows someone who was," Fredericks says. "So it's real." Still, some people in the area, like 31-year resident Bill Rothman, think it's a crazy idea. "They're not security cameras," he says. "They're insecurity cameras." Nicole Ozer of the American Civil Liberties Union agrees. "The city of Tiburon has bought itself a $200,000 bottle of snake oil," she says. Ozer says that by spending money on cameras instead of police officers, the town is doing something that's less safe. She says the move creates a hornet's nest of potential lawsuits. "These cameras are expensive, there's no evidence that they'll do anything to make Tiburon safer and, once these cameras are up, they can very easily be used for spying and discriminatory targeting," she says. Police run license-plate checks all the time, says Jennifer King, an expert in technology and public policy at the University of California, Berkeley. Tiburon's plan is to just run many plate checks. The problem, she says, is that once the equipment is installed, safeguards to protect privacy can change. For instance, the license plate information is supposed to be purged after eight hours, but what if a crime occurs and suddenly that information becomes more important? "They may start today by keeping it eight hours, but I'll almost bet you that what they'll find is that somebody will come back and go, 'If only we had the data from those cameras,'" she says. "We call it 'scope creep' in the technology world. That scope can really crawl, really grow very quickly." King says eventually this technology might end up being used against Tiburon residents themselves. Electronic bridge toll records hold similar information on license plates and those have been subpoenaed for all kinds of things, including divorce cases.